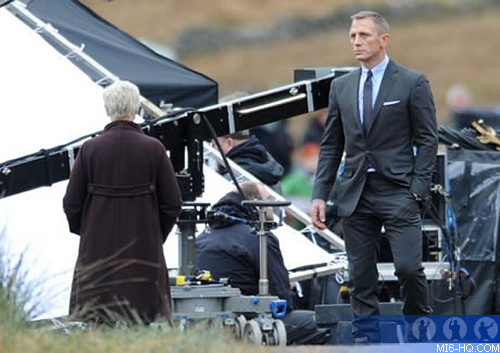 Daniel Craig and Dame Judi Dench were north of the border in Glencoe, Scotland, today for a "Skyfall" location shoot with the stunning 3,353ft mountain Buachaille Etive Mor as a backdrop. 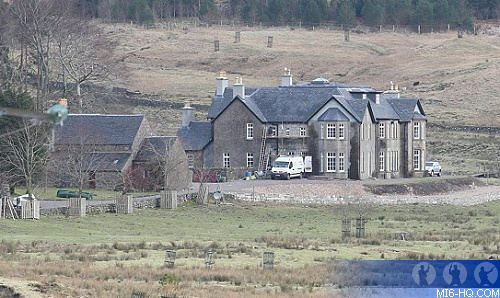 The filming took place about an hour's walk from the A82 in near freezing conditions, on a trail which was closed to the public for the day. Crew had been on location for a couple of days setting up beforehand, but Craig and Dench were only in Scotland for the day, along with 007's vintage Aston Martin DB5. Ben Collins (AKA The Stig) was also on location for driving duty, steering the DB5 towards an old estate. Both Craig and Dench were spotted at Glasgow airport in the evening, heading back to London. In the original novels by Ian Fleming, James Bond's father had hailed from Glencoe. The author was also known to love the area. As confirmed by the official 007 Twitter feed, one of the scenes captured today - #137 - takes place shortly after the Trinity Square (Whitehall) action that was filmed recently, and immediately after the industrial estate action with the DB5 captured before Christmas.